A deep sigh of happiness and an ache from the computer glare. Is there anything better on a grey cold winter day than to gaze on hundreds and hundreds of photos of flowers in the garden and in vases, knowing you have grown the lot? 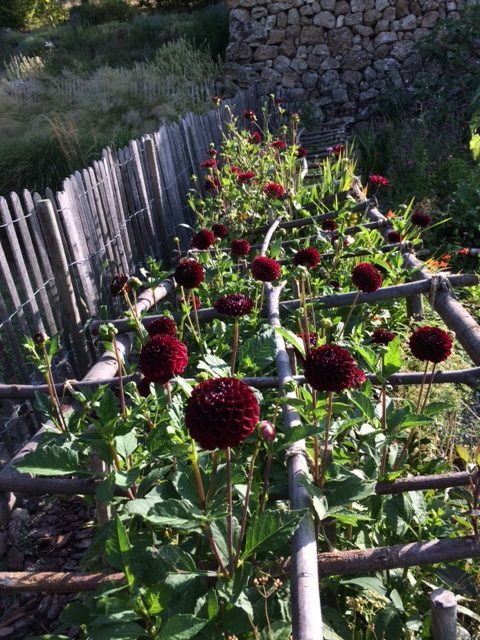 My cut flower garden in the potager has grown so large over the past few years that I have decided to create a whole new blog post to incorporate them. And yes, it’s an excuse for blazing colour. All my life I have yearned for cut flowers for the house. I blame it on too many years reading novels set in grand country homes where the mistress of the house was required each morning to go over the menus with Cook, and then head out to the garden armed with a basket and secateurs and a big floppy hat and cut flowers for the house. Or more likely ‘flahs for the hiss’. Devising menus with Cook these days involves a consultation with myself and the vegetable patch. And I do head out to the garden armed with secateurs and a floppy hat most of the year. But my flowers for the house has expanded in a huge way. 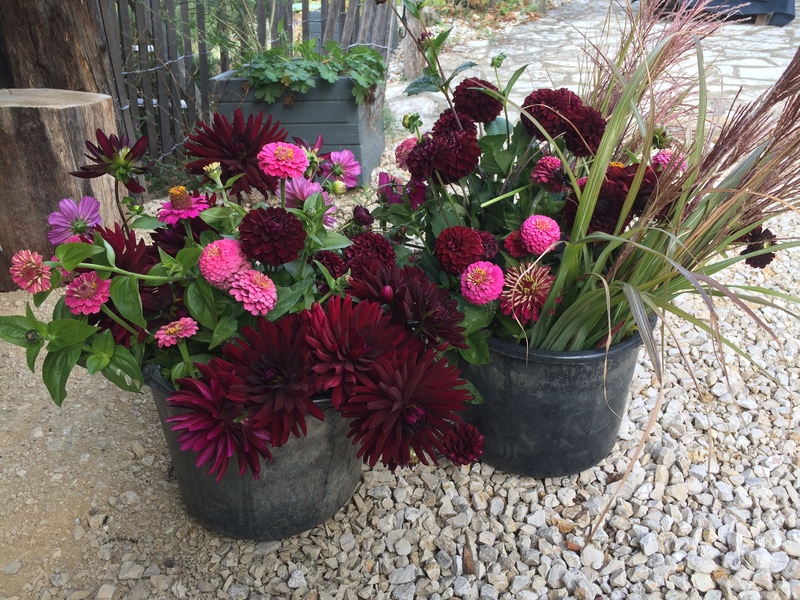 If you follow my garden blogs you will know that every Thursday from spring until well into November I take up around seven or eight bouquets of flowers to the market. These get delivered to friends and two shops (sometimes three) and we have a lovely bartering system where I come back with goods in exchange. But what I am really exchanging is happiness. 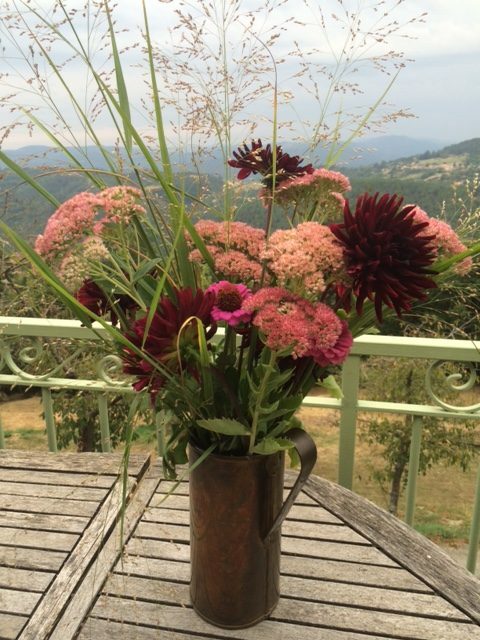 I love growing flowers; I have way too many even after I have decorated both Jean Daniel and Elodie’s house each week, along with ours. So I give them away. And it is a great ice breaker. It’s a fine reputation to have. And I can’t tell you how many friends I have made this way. Especially as one of my best bouquets always goes to Aurelie in the butcher’s shop in the local town. And just about everyone in the district will turn up there on a Thursday. And when the queues are so long, it’s always nice to gaze on a large bouquet on the counter while you wait your turn. Rather than tutting about the time. Of the seventeen beds in the vegetable garden, I decided to keep the long skinny bed at the end nearest the lawn strictly for flowers. This has grown now to incorporate two other beds. And there are plenty of flowers that self-seed where they will. So that means the cerinthe flowers grow in around the raspberry bed. 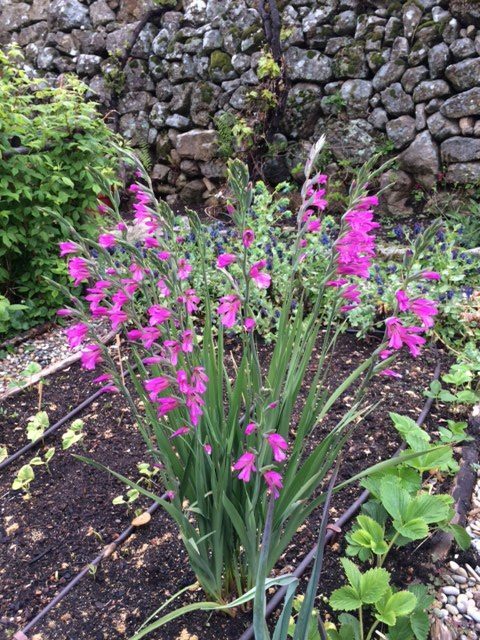 The gladiolus pop up beside the dwarf French beans, and the wretched hesperis will self-sow anywhere it likes. It makes for interesting combinations. I rescued two small plants of the acid yellow achillea Gold Plate from the old pool bank wildflower mix. And I now have three enormous patches right where the potatoes usually grow. But I have come to admire them as a cut flower. (I was never a yellow flower fan.) 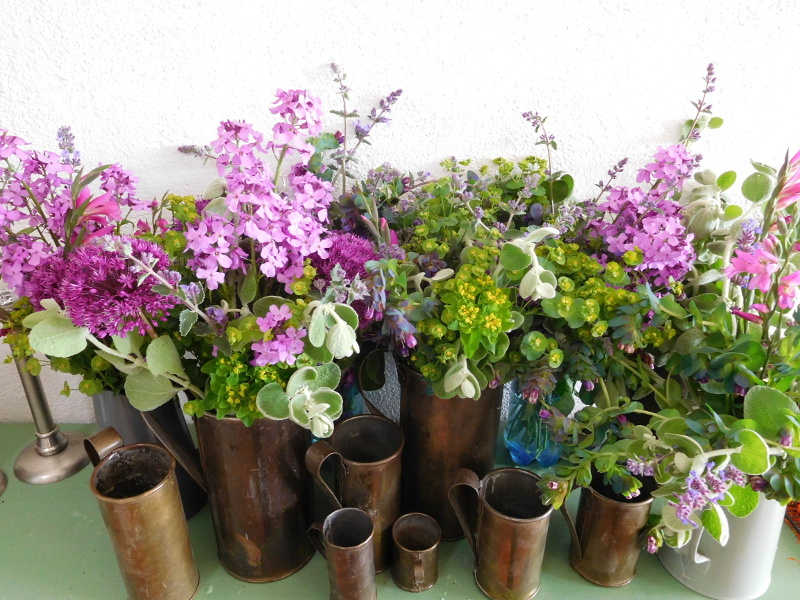 And particularly as the flowers dry really well and don’t lose their zing. 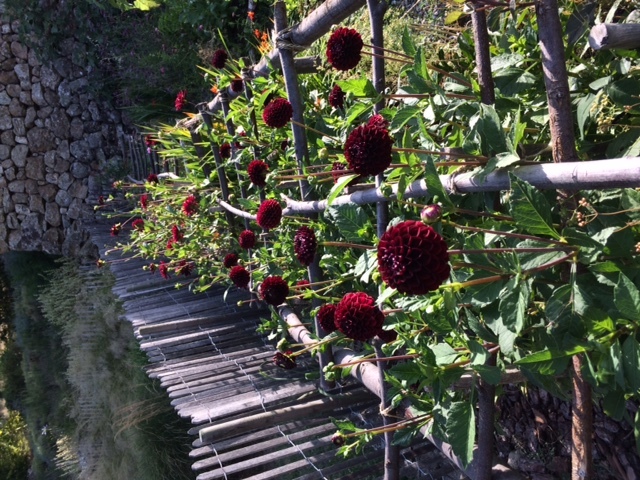 But the main reason I have spread to other beds is that the dahlias have quite taken over. Despite our cold, snowy winters, I leave my dahlias in the ground. Laziness, ineptitude… I just couldn’t bare to lift the frost tender tubers and store them. Only to find them rotting in spring. So they live all year round with a huge pile of mulch over the top. And each Spring I whoop for joy when the leaves emerge. But I have had to do battle with the mole rats who thought I was being an over-generous host by providing them with nutritious tubers over the winter. So I now plant them in ordinary builders’ buckets (with holes drilled in the base) and plunge the whole thing deep in the ground. You can see what lengths I have to take to protect the plants from predation. But I am rewarded with pretty constant flowers all summer up to the first frosts. There is room (just) to cram in some drumstick alliums and lovely crocosmia. And I have moved three of the Gertrude Jekyll roses (planter pots and all) from the courtyard. I love my roses. Especially now I don’t have to lavish so much care on them. Their roots can now seek out the moisture here in the potager, rather than wait for me to water them when they were constrained in their pots in the courtyard. Elsewhere in the potager I let parsnips go to seed – you get great seedheads from those. Marjoram in flower. And of course self seeded sunflowers. I gave up sowing them directly years ago. I just see where they pop up in the garden (the birds scatter them) and lift them to the least annoying position in among the rocket. And anything is fair game for the bouquets. Swiss chard bolting, I’ll take those. Miscanthus leaves, bolting lettuce, shrubs, herbs. It’s all fair game when you have to come up with almost 10 bouquets every week. And each year I am lured by the temptation in the seed catalogues to try more. 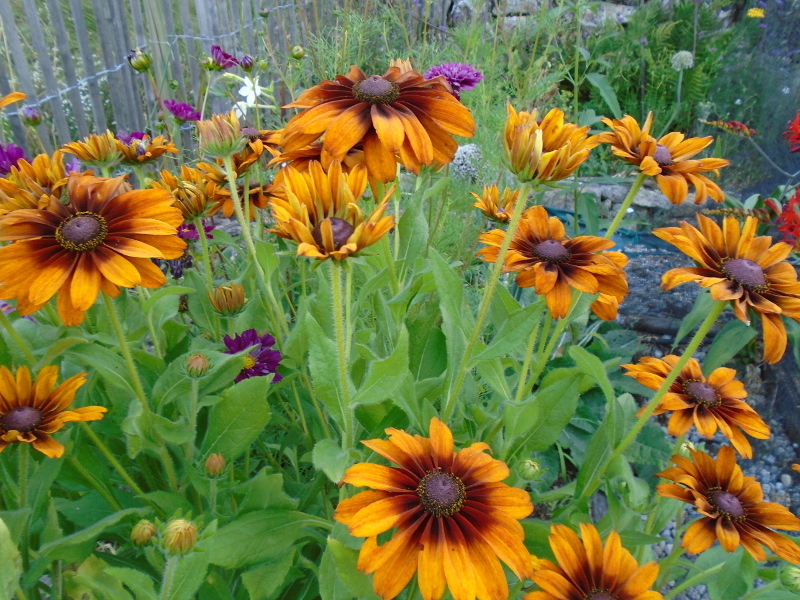 I dutifully sow zinnia fresh each year; I try marigolds (they never get high enough for good bouquets for me), rudbeckias – almost an annual with the rate they expire on me, tithonia (the stalks were too fragile) you name it, I’ll give it a go. 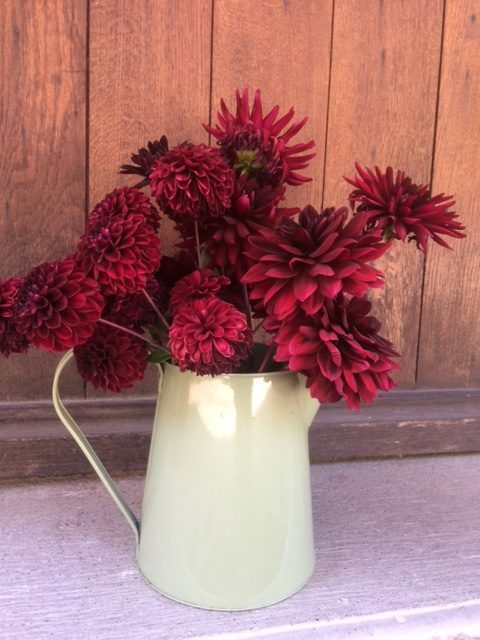 And come November I will probably pick my last vase of flowers from sedums, flowering grasses, zinnias and the last of the dahlias clinging on against the cold. All I need do then is clear the beds, tidy up, mulch like mad and wait for the first daffodils in early February in Spring. Just so amazing and impressive!!! So wonderful to see all the colors and flowers! I’m so pleased you were able to log on and read it. I always worry about the internet capacity of your ship. How absolutely grand! Your market bouquets are ethereal. This photo essay and words brightened up a dull day! I wish you lived closer so I could fill your house with flowers. Oh Lindy. I just took a virtual stroll through your flower garden. I am so ignorant. What is a potager? Your garden is so extensive and there are SO many beautiful flowers. Your life in France sounds wonderful. I think you inherited a lot of Gran’s genes. How she would have loved your garden, especially the roses. A visit to you one day is definitely on my bucket list. What a lovely treat to wake up to this morning. Thank you lovely cousin. Morning Marg, a potager is just the French term for a vegetable garden. 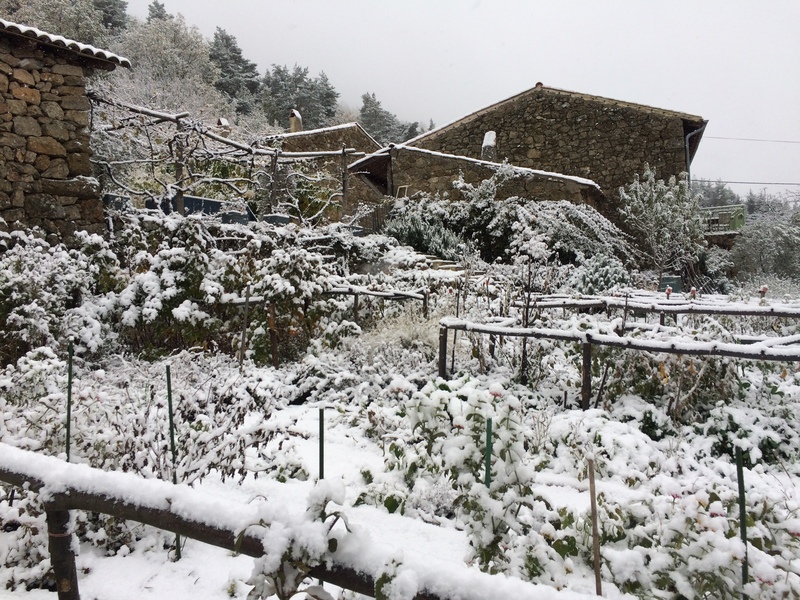 But the main principal of the way we grow vegetables in France is that we intersperse all the vegetables with flowers. Not just for aesthetics, but to encourage the pollinating insects. But design often plays a part. Not just regimental rows, but design and often incorporating water. I have such hazy memories of Gran’s roses. But I seem to recall a garden just bursting with colour and scent. She would have loved the new movement to bring back old breeds of English roses but cross breed them with repeat flowerers. Thanks for educating me about “potager”. My memory of Gran’s garden is similar but then I take a virtual walk around the back and have memories of a type of green house full of beautiful orchids. Her front garden, in my memory had no lawn, just beds full of roses. 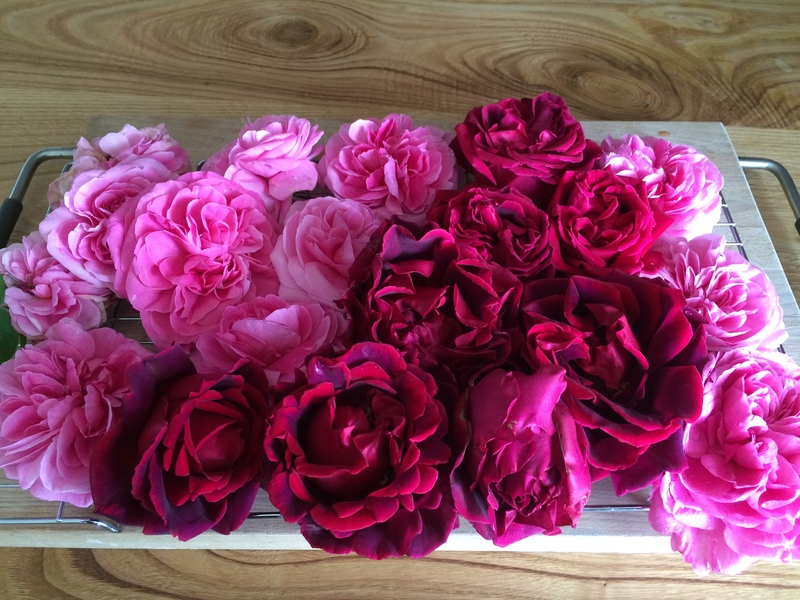 Hi Marg, I think I only saw the front garden: and you are right, it was a forest of roses!